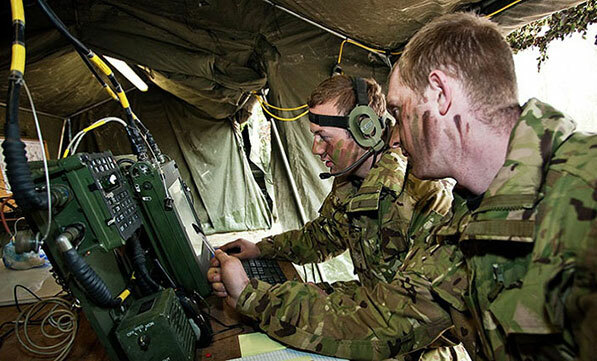 Communication is vital in the Army. You’ll be in charge of cutting-edge systems that help us keep in contact, wherever we are in the world. You could be a soldier on the ground. Or you could be part of a crew in an armoured vehicle. Either way, you may have to deal with secret information and work as part of a team. First-class training will teach you everything you need to know: telecommunications, communications engineering, computing and IT. It’s a great skillset for a career outside the Army too. With sports and Adventurous Training, you’ll have a full, exciting life. Then it’s off to the Royal School of Military Engineering Regiment near Camberley for nine weeks. Here, you learn military engineering skills such as knots and lashings, demolition, mine warfare and bridge building. Then it’s 10 weeks’ technical training, where you’ll learn communication skills and how to operate the digital Bowman Radio System. Your training will depend on your military experience and trade qualifications.